Noisy or slow operation is a common sign that a unit is in need of repair - there could be a problem with the motor, a worn out gear, or perhaps the opener is simply reaching the end of its service life. Luckily our technicians are experienced when it comes to all these issues – they'll be able to assess the condition of your opener and recommend whether one or more of the parts should be replaced. Sometimes garage doors can seem to be activated by themselves. This can be a frequent occurrence for some people, or a random one off for others. Most opener designs will work according to a frequency that is unique. But now and then, other instruments can transmit frequencies that are the same as your garage doors. You may live near facilities that transmit a range of radio signals, or near a neighbor whose opener or alternative device is disrupting yours. If you suspect this is happening with your system, just get in touch – our experts will be able to sort the problem. If your remote appears to send a signal but prompts no response it might benefit from reprogramming. You can usually tell if the remote is sending commands if its red light flashes every time you push one of its buttons. Most remotes will have a specific set of stages the user must go through to reprogram them. 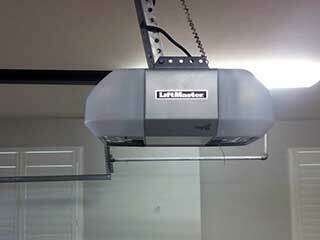 We can replace faulty remotes as well as repair any other part of your garage door opener. We can assist with all designs of doors including overhead, sliding doors and the traditional swing variety. No issue is beyond our expertise! Call us today to get your opener and remote controller back to good working order.